with topics spanning sports injuries, cerebral palsy assessement, occupational health, and artistic clinical applications. 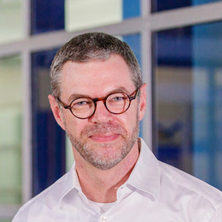 In 2019 the studies of axial loading and the Raine cohort will progress to explore whether neuromuscular control and other variables influence idiopathic spinal deformity (scoliosis), extending to collaboration with the QUT Biomechanics and Spine Research Group, with Prof Peter Pivonka and Maree Izatt. In 2019 Andrew's scope is also branching out to telehealth research. Telehealth encompasses research innovating with new tools and their validity, clinical trials and societal efficacy to translate the ideas and opportunities into best practice. Andrew's first study in this area assessed whether online resources for people with back pain met their information needs. This year Andrew is collaborating on a pilot study using virtual reality to familiarise patients with their surgical admission and their first post-operative physiotherapy appointment. Postural control dysfunction in children with Cerebral Palsy: impact on function and novel interventions for treatment. Interpreting pain symptoms and how pain affects neuromuscular control in dancers: if I'm in pain, how should I train? Two examples of "cuboid syndrome" with active bone pathology: why did manual therapy help? Sitting versus standing: Does the intradiscal pressure cause disc degeneration or low back pain? Dewar, Rosalee, Claus, Andrew, Tucker, Kylie, Ware, Robert and Johnston, Leanne (2018). Reproducibility of the Kids-Balance Evaluation Systems Test (Kids-BESTest) and the Mini-BESTest in children with cerebral palsy. In: Australasian Academy of Cerebral Palsy and Developmental Medicine, Auckland, New Zealand, (). 21-24 March 2018. Hu, E., Hodges, P. W. and Claus, A. P. (2017). Assessment of the soft tissue artefact with surface measures for lumbar spinal motion using ultrasound imaging. In: International Society of Biomechanics XXVI Congress, Brisbane Convention & Exhibition Centre, Brisbane, (). 23-27 July 2017. Young, A., Tucker, K., Verrel, J., Pounds, P. and Claus, A. (2017). Mechanical perturbation of spinal postural control with sudden axial load demonstrates different timing of trunk muscles in sitting versus standing. In: International Society of Biomechanics XXVI Congress, Brisbane / Brisbane Convention Centre, (). 23-27 July 2017. Dewar, R., Claus, A., Tucker, K. and Johnston, L. (2016). Postural control in children with cerebral palsy: a Delphi consensus study on definitions, frameworks, assessments and interventions. In: 8th Biennial conference of the Australasian Academy of Cerebral Palsy and Developmental Medicine, Adelaide, Australia, (43-44). 30 March - 2 April 2016. Claus, A., Mellor, R. and McLean, R. (2015). Healthy athletes within normal weight range are susceptible to DVT: 5 case studies. In: Australian Physiotherapy Association, Gold Coast, QLD, Australia, (). 3-6 October 2015. Hu, E., Claus, A. and Hodges, P. (2015). How accurate are surface measures for change in spinal posture? a novel approach that quantified skin artefact with ultrasound imaging. In: Australian Physiotherapy Association, Gold Coast, QLD, Australia, (). 3-6 October 2015. Chia KL, Claus AP and Hodges PW (2013). Do people who report low back pain with sitting, sit in a different posture to those without pain? An observational study. In: Australian Physiotherapy Association, Melbourne, Australia, (). 17-20 October 2013. Park, Rachel, Tsao, Henry, Claus, Andrew, Cresswell, Andrew and Hodges, Paul (2011). Changes in regional activity of the psoas major and quadratus lumborum with different trunk and hip tasks and spinal curvatures in sitting. In: XXIIIrd Congress of the International Society of Biomechanics, Brussels, Belgium, (). 3-7 July 2011. Spinal posture in sitting: How do we sit and how should we sit? Claus A, Hides J, Moseley L and Hodges P (2009). Spinal posture in sitting: How do we sit and how should we sit?. In: International Society for Postural and Gait Research, Bologna Italy, (). 25-29 June 2009. Spinal postures in sitting: Can researchers and subjects differentiate postures at lumbar and thoraco-lumbar regions? Claus, A., Hides, J., Moseley, L. and Hodges, P. (2007). Spinal postures in sitting: Can researchers and subjects differentiate postures at lumbar and thoraco-lumbar regions?. In: ISPGR 2007 Accepted Abstracts. ISPGR 18th International Conference, Burlington, USA, (63-64). 14-18 July 2007. Andrew Claus (2008). Physiology of Sitting PhD Thesis, School of Health & Rehabilitation Sciences, The University of Queensland.